The Green Deal is designed to overcome inherent barriers to implementing energy saving measures and therefore take the customer on a Green Deal Journey. 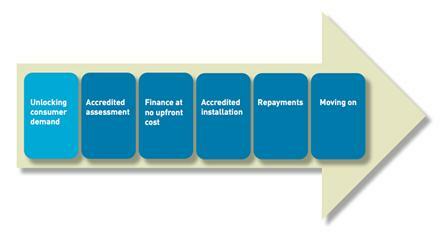 The first step in your Green Deal journey is to get a Green Deal Assessment done. This can be done by a qualified Green Deal Adviser for between £100 and £150. Green Deal Assessors can be independent, an installer themselves or associated with a Green Deal Provider or local authority. Your Green Deal assessment lets you know whether the Green Deal is good value for you, and is a useful resource for you throughout the Green Deal process. You then need to find a Green Deal Provider. Providers can be well known companies such as B&Q, or can be installer firms. Your Provider acts as your point of contact throughout the Green Deal process, and has financial backers providing money for your loan. The provider will offer you quotes for different improvements from their list of accredited installers, and you can shop around the Providers for the best quote. When you have chosen your Provider and your improvements the Provider will create a Green Deal Plan for you, which is an agreement detailing which improvements will be carried out, how much the work will cost and how much your monthly payments on your energy bill will be including around 7% interest. If you are happy with your plan, your Provider will get your agreed Green Deal installer to carry out the work. Your loan repayments will then appear on your monthly energy bill. When you pay the bill, your energy supplier passes this money to your Green Deal Provider to pay back the loan.